This summer, enjoy an unforgettable stay at Arthouse Hotel. The Liverpool city centre hotel is the perfect spot for spending a sizzling night in the city. Liverpool nightlife is better than ever over the summer months, with an array of beer gardens open for business and unmissable events both day and night. 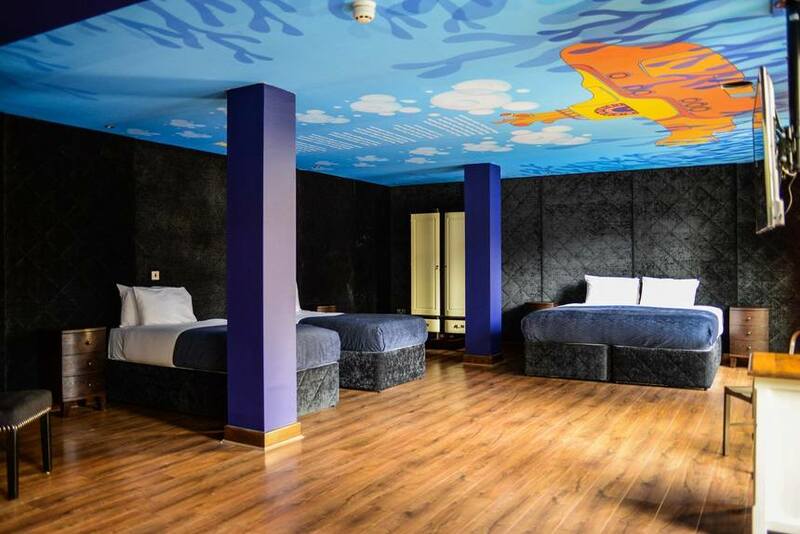 Sail to sea this summer with a stay in our bright and bold Yellow Submarine room at Arthouse Hotel. This striking room sleeps up to 4 guests and features a double whirlpool bath and flat screen TV. Paying tribute to the Fab Four, this is the perfect spot for Beatles fans to enjoy a night in Liverpool. 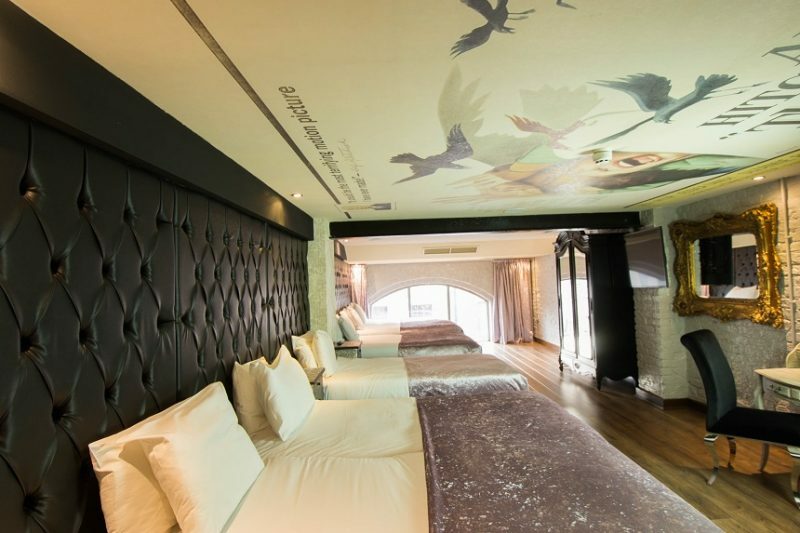 The Beatles themed hotel room is one of a kind, celebrating the iconic 1968 film and iconic Beatles song. 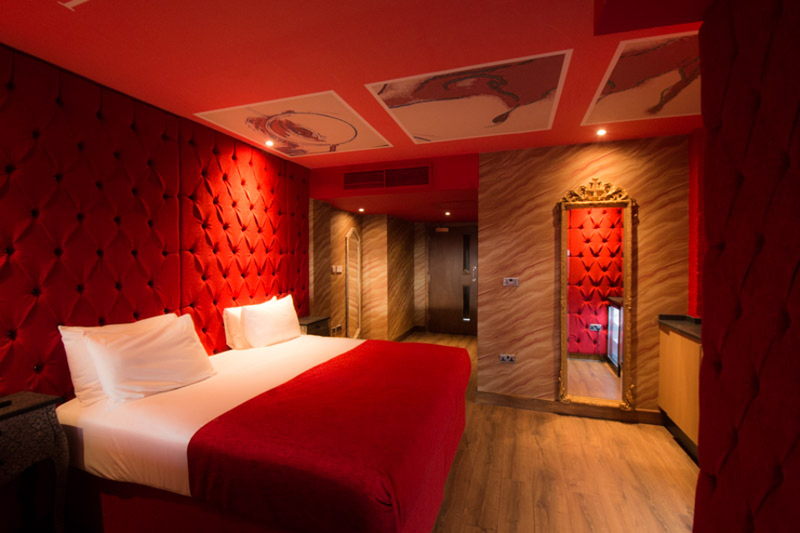 So whether you’ll be heading to the Cavern Club this summer in Liverpool or taking a journey to Strawberry Fields, don’t miss the chance to finish your day in style at Arthouse Hotel. You’ll feel on top of the world in our dazzling Skyline suites. Designed with style, comfort and luxury in mind, this exquisite space is decorated with a fusion of royal blue, gold and white. Dived into 2 amazing suites, the interconnected rooms can sleep up to 12 people. With a spacious private terrace showcasing breathtaking views across Liverpool, the Skyline Suite is the ultimate summer party destination. Make the most of the room with a pamper in the giant whirlpool bath before you step out onto the terrace with a glass of bubbly! Whether you choose to stay in or head out and explore, you’ll find the best of Liverpool nightlife right on your doorstep. Capturing the effervescent glamour of Marilyn Monroe, our picture-perfect Marilyn Monroe room is the go-to destination for a summer stay with the girls! This spacious room celebrates both the Hollywood icon and Andy Warhol’s silkscreen painting Marilyn Diptych. 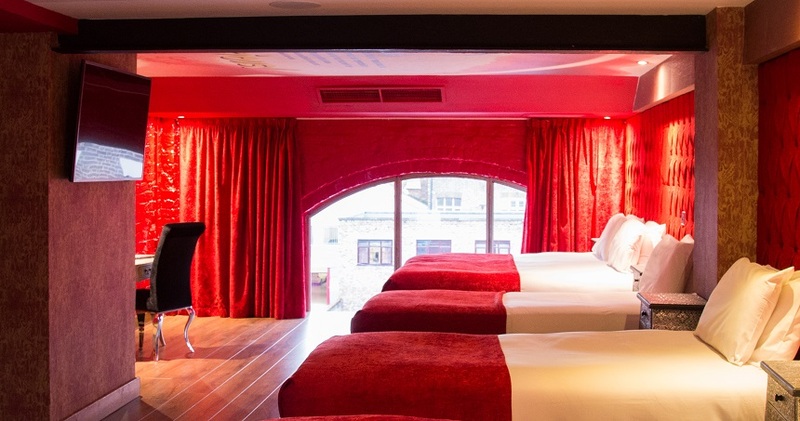 The bright shades of red create the perfect party atmosphere, bringing guests a stylish alternative to ordinary hotel accommodation. This spectacular room features a whirlpool bath, TV screen, dressing table and large windows letting the summer sun shine in. The city is alive with the sound of music this summer in Liverpool! 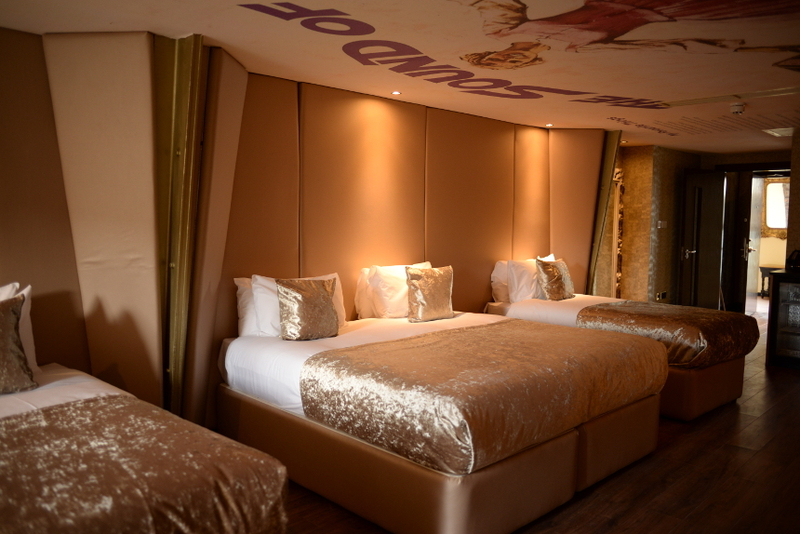 Sleeping up to 6 people, our stunning Sound of Music room will sweep you off your feet. Celebrating the timeless musical movie, this themed room is decorated with a fusion of glistening gold, ensuring you feel like a VIP from start to finish. The spectacular space features a large screen TV, double whirlpool bath and kitchenette. So, why not see for yourself this summer in Liverpool? 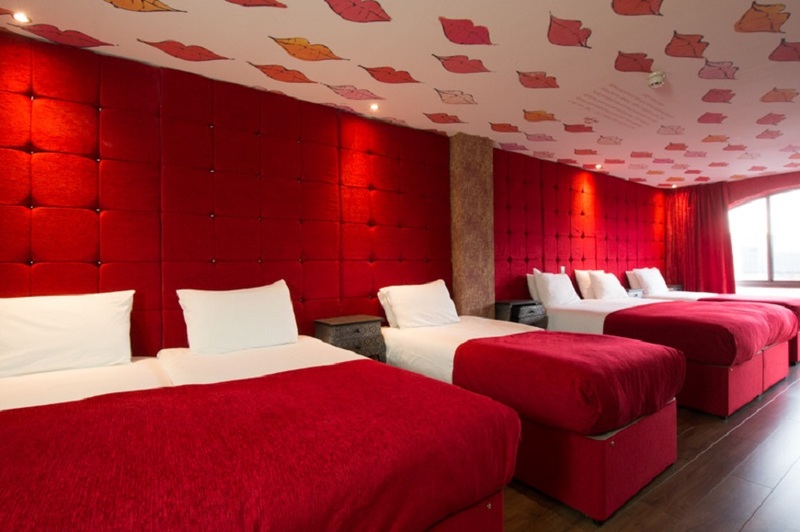 Sleeping up to 6 guests, Arthouse Hotel’s Lips room is ideal for a summer stay in Liverpool. 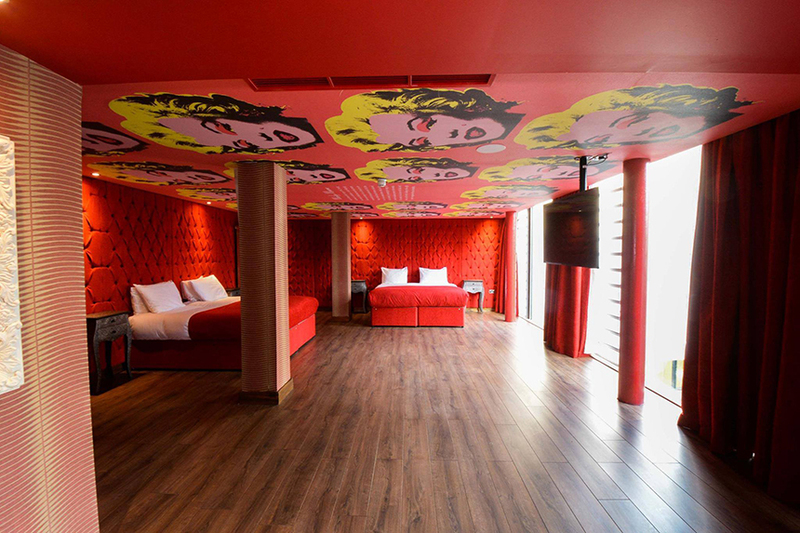 Popular for girlie weekend breaks in Liverpool city centre, our stylish Lips room is inspired by the colourful yet simplistic piece of art by Andy Warhol. Guests can enjoy the spacious whirlpool bath, perfect for some relaxation. Arthouse Hotel specialises in luxury group accommodation, ensuring you and your friends can stay within the one room. At Arthouse Hotel, we always have a wide range of hotel offers in Liverpool for you to choose from. One of our most unmissable packages at the moment is our Stay & Dine offer. To find out more or to book your stay with us in Liverpool city centre, you can reach our helpful team on 0151 601 8801. We look forward to seeing you soon! If you’ll be visiting Liverpool to explore the best of The Beatles, look no further. At Arthouse Hotel, our guests can enjoy stylish, affordable Beatles-themed hotel rooms. Based in the heart of the city centre, you’ll find the best of Liverpool nightlife right on your doorstep. Plus, famous landmarks and cultural attractions just a short stroll away. Arthouse Hotel is without a doubt one of the best places to stay in Liverpool. Our range of rooms are themed around music and film, showcasing the very best of pop culture. We have two amazing Beatles rooms to choose from; our Yellow Submarine room and John Lennon room each offer something entirely unique. 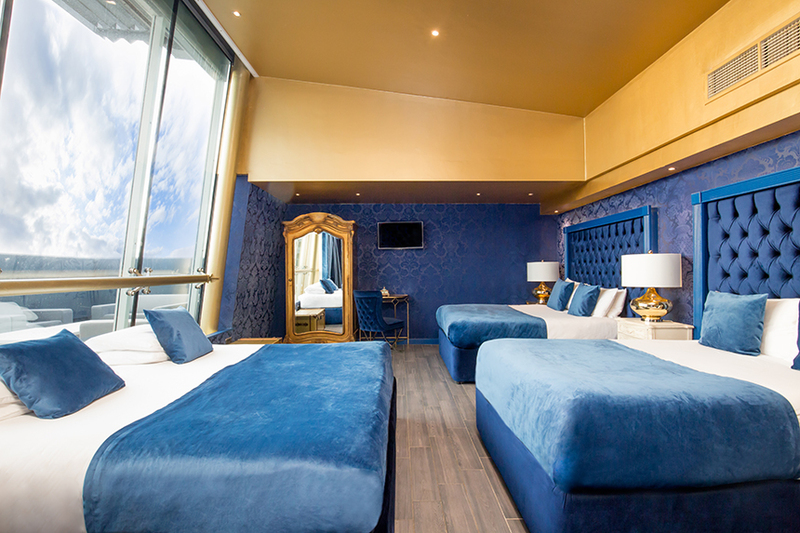 Our bright and airy Yellow Submarine room invites up to 4 guests to enjoy waves of blue and fantastic facilities. Inspired by the 1968 film of the same title, Beatles fans can look forward to an array of amenities within this picture-perfect space. The room includes a double whirlpool bath, Bluetooth sound system and flat screen TV, ideal for those wishing to sit back and relax after a Hard Day’s Night. This spacious room is perfect for a summer stay in Liverpool, especially with friends or family. Designed in royal red, our John Lennon room celebrates both the Beatles legend and the work of And Warhol. Inspired by the Menlove Ave. album cover, this stylish space captures the eccentricity of two of the world’s most iconic artists. Sleeping up to 6 guests, this dreamy room features multiple deluxe beds, a large whirlpool bath, kitchenette space and Bluetooth. Ideal for hosting special celebrations or simply a special night’s stay, our John Lennon room is one of a kind. Home to the Fab Four, fans visit from across the globe visit the city to explore Beatles attractions and landmarks. From Woolton Village, Penny Lane and Strawberry Fields to The Beatles Story museum, fans certainly never find themselves short of things to see or do. 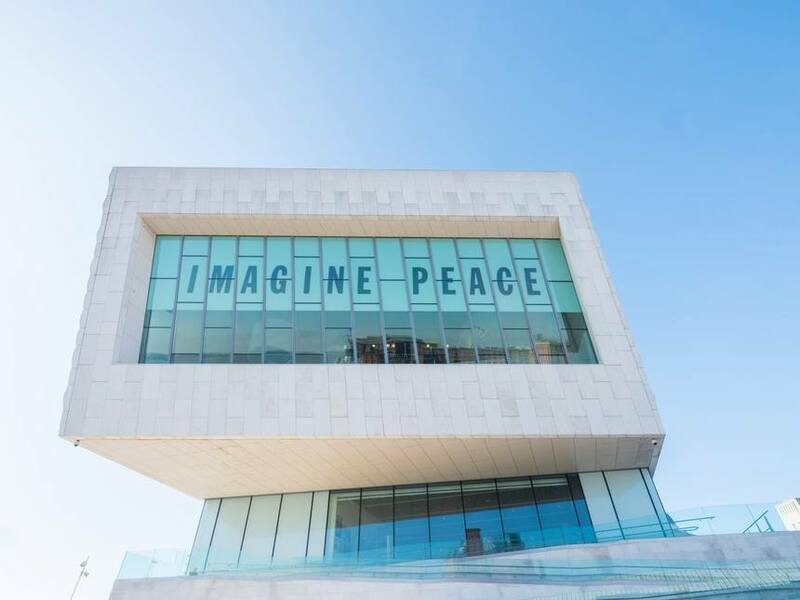 One of the latest Beatles attractions in Liverpool, you won’t want to miss out on Double Fantasy – John & Yoko. The free exhibition is on at the Museum of Liverpool, and explores the creative chemistry of the world’s most iconic couple. The moving exhibition takes fans on a journey through time, featuring personal objects alongside art, music and film. Fans can also enjoy displays drawn from Yoko’s private collection, which have never been shown before. This immersive experience is one that you’ll treasure. While you’re visiting, why not enjoy a bespoke tour package? The Shankly Experience specialises in themed tours around Liverpool, designed to offer a personal and unique exploration of the city. The Fab Four and Shanks Tour is ideal for Beatles and football fans. The fascinating tour tells the story of how the rise of the Beatles throughout the 60s ran parallel with the success of Liverpool FC under Bill Shankly’s management. 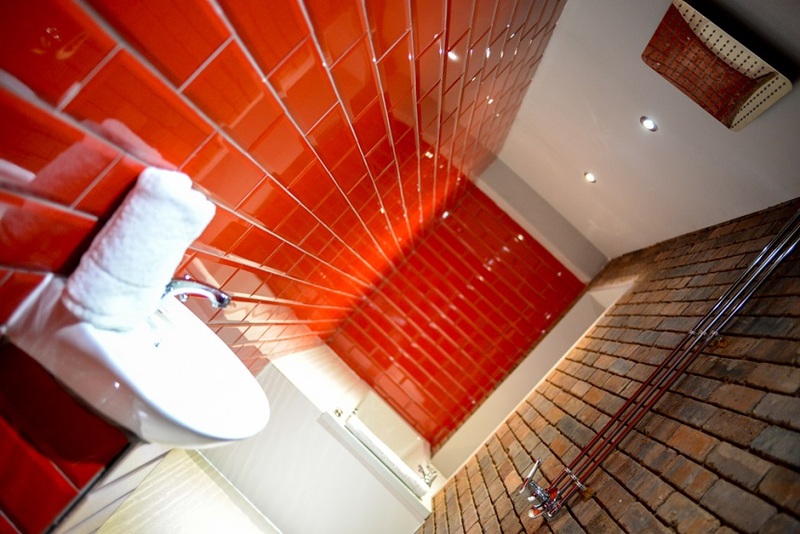 Arthouse Hotel is situated only moments from Liverpool’s best nightlife venues. From quirky bars to live music venues, you’ll find local favourites right on your doorstep. Plus, if you want to experience a night out in true Beatles style, we’re only a short walk from the Fab Four’s favourite places to drink in the city. The Grapes and Ye Cracke were particular favourites, and remain just as popular today. You’ll find The Grapes sitting on Mathew Street, the same street made famous by Beatles landmark The Cavern Club. Meanwhile, discover the charms of Ye Cracke tucked away on the streets surrounding John Lennon’s old stomping ground. John, Stuart Sutcliffe and other students would regularly meet at Ye Cracke alongside artists, poets and pub-politicans. We’re sure you can imagine the animated conversations and characters to have passed through its doors. You may have even seen a grainy photograph of John and his college friends sitting outside the pub. At Arthouse Hotel, we want you to have the best possible stay. That’s why we always have a range of unmissable offers to choose from. Some of our most popular hotel deals in Liverpool include our Stay & Dine offer and Movie Star Magic offer. To enquire further or to book your stay at Arthouse Hotel Liverpool, we’d love to hear from you today on 0151 601 8801. A girls’ night out, you’ve got to love them! It’s a sacred ritual that is beneficial to both the mind and body. Every night is slightly different, but you all know that the following things can and will occur each ladies’ night, without fail. You all live all over the gaff, but you’ll cross countries and continents to get together for that all important night on the town together. Organising the date will be tricky and you’ll go through a thousand WhatsApp messages, but you and the girls will get there in the end. Once the night is decided, you’ve been planning outfits for weeks, but you still have no idea what to wear. And of course, you”ll take at least half a day to get ready, because we all know it’s one of the best parts of the night. 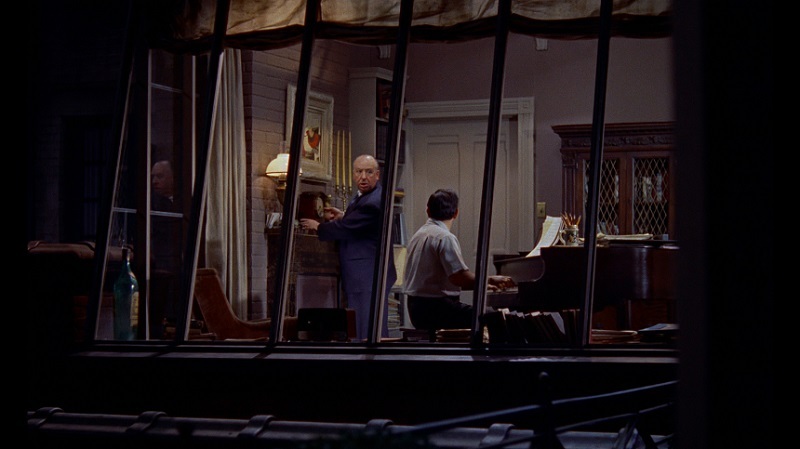 Before you leave the house, two hundred pictures have already been taken… and most of them are identical to each other. The perfect group photo on a girls’ night is a must! We all know pre-drinks is usually more fun that the actual night out, which usually results in you drinking far too much. You’ll definitely play Never Have I Ever, Ring of Fire and have rambling conversations about the last hilarious time you got drunk together. In your heads, you are all Beyoncé. To the neighbours, there’s a very high possibility that a whole bunch of cats are being strangled next door. Quick! The taxi man is getting angry! Time to put on the ‘act sober’ routine for the bouncers. One could be dancing solidly for about three hours on a girls’ night out. Sure it’s practically like going to the gym? Just hovering. Not really dancing, not saying anything, but occasionally trying to touch people inappropriately. Always seem like the best idea you’ve ever had. The you of tomorrow can deal with the consequences. You couldn’t possibly brave the bathroom alone?! Just a little touch up can easily end in tragedy. You’re sure to unite with other girl gangs in the loos and compliment them all on their appearance. It’s just bound to happen. We don’t know why and no one can really remember, but it always happens. You’ll be praying to the feet gods for some kind of relief by the end of the night. Always seems like a great idea … never is. You’ll always desperately try and counter act the inevitable hangover with pints of H20. You wake up with a seriously dry mouth. You can barely swallow, but the prospect of getting out of bed for water is daunting. You’ll then start asking google if you can die from a hangover. That terrifying ping of your phone and the utter dread of finding out what you looked like all night. We hope you’ve enjoyed our list of everything that always happens on a girls’ night out. 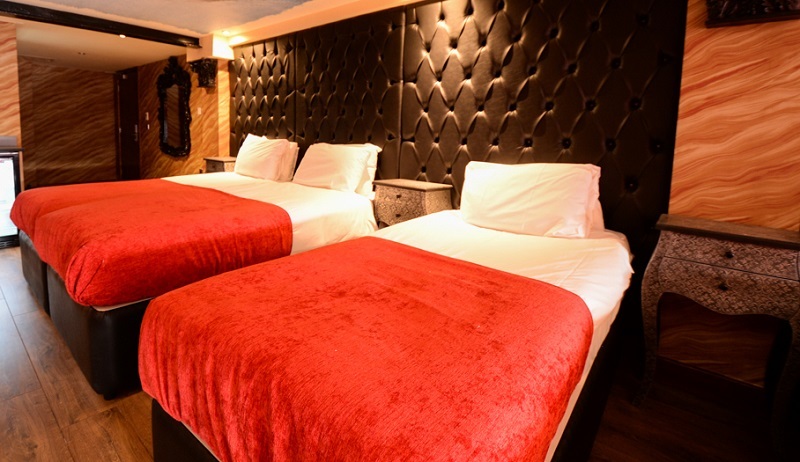 If you’re planning the next big night on the town with your special girl gang, why not book a stay in Arthouse Hotel, in the heart of Liverpool city centre and really make the most of your time together. 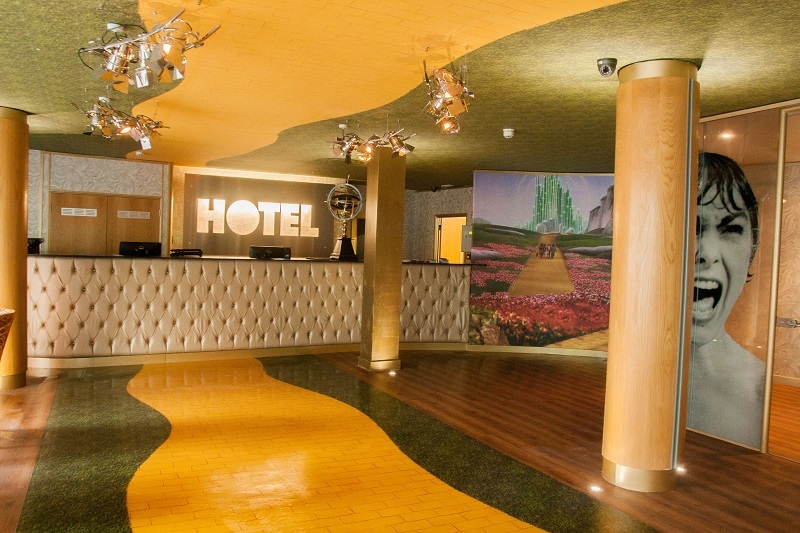 Our movie-themed hotel is perfect for groups of friends planning a fun night away together. Each of our luxurious rooms have been designed with comfort and group stays in mind, sleeping up to 12 people! Check out our fabulous Here Come the Girls offer, this includes a 2 night stay in a luxurious suite, delicious breakfast each morning, party ready makeover including hair or make up and a tasty 2-course meal at a Signature Living restaurant one evening. If you’d like to find out more, get in touch with our friendly team today.